One of the reasons I like to write these reflections on the gospel is that I enjoy learning all sorts of interesting tidbits and facts. 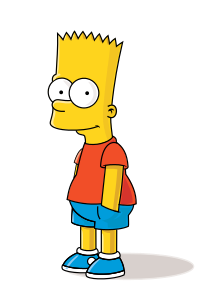 Bartimaeus – a name I would have just shorted to Bart, really means something more. Back in Jesus’ time, it would have been broken up into Bar-Timaeus, where BAR means son – so son of Timaeus. So the people around Jericho knew this blind beggar as the son of Timaeus. Imagine how hard it must have been XNUMX years ago for someone who is blind. There was no support structure for him. There was no braille which would allow him to read. Who knows if his father, Timaeus, was still alive and able to help him. All we know is that Bartimaeus was sitting on the his cloak on the side of the road, unable to see and totally dependent upon the generosity of those passing along the road to give him money to buy food. As the throng of people following Jesus pass by, Bartimaeus could likely view this as a huge windfall. Lots of people mean lots of shekels which might be given to him. But instead, what we hear from Bartimaeus isn’t “Jesus – will you as well give me some money? Will you tell your followers to give me money if they really care about the poor?” What we hear is Bartimaeus crying out for Jesus. The crowd tries to silence him, saying that Jesus cannot be bothered. This echos the disciples telling the children to leave Jesus alone. But Bartimaeus boldly continues to call for Jesus, over the objection of the crowd. Imagine how brave he had to be – people were likely shouting at him and pushing him to be quiet, and truly Bartimaeus is the least powerful of all people. Yet he continues to cry out until Jesus notices him. Apparently, Bartimaeus’ request was according to God’s will, because Jesus’ reply was, “Go your way; your faith has saved you.” and the son of Timaeus had his eyesight restored. It’s a nice story about faith, persevering, and blessing, but I think there is a backstory that is pretty important here, that we aren’t told directly. There used to be a radio broadcaster named Paul Harvey, who would lead off with a short story that sounded mundane – a basic everyday story. Then we would tell “The Rest of the Story”. The Backstory. And all at once, this everyday story would become extra-ordinary. Being blind, Bartimaeus probably didn’t move too far from his home and stayed near the road where people were travelling on the way to Jerusalem. One of the things we hear about blind people like Bartimaeus is that their other senses are heightened. There is even a superhero named Daredevil, who is able to sense the world better through bat-like radar, because he is blind. So we might imagine that Bartimaeus is really good at listening. We also might guess that he speaks to the travelers passing to get the latest news of what is happening in the world. In the past three years, he has likely been hearing some incredible things from people travelling along his road. Some dude turning water into wine. Then healing of sick people and lepers. Feeding XNUMX people with a few loaves and fish. Raising a dead girl from the grave. At first, he probably thought they were just stories. But as more and more stories came through, it likely started to sound more probably. At some point, someone who Bartimaeus knew and trusted said that he had experienced Jesus’ miracles firsthand. This person might have even suggested to Bartimaeus that Jesus was the Messiah. Evangelicals call this a Credible witness. At this point, or maybe after praying about it or speaking with other credible witnesses, Bartimaeus probably decided that Jesus was the Messiah. That he believed in his coming Kingship. So when Jesus passed by, Bartimaeus’ heart was already primed. He would not be shouted down by a crowd. He wanted to see his Messiah. And when Jesus gave him what he asked for, did Bartimaeus say thank you and go his own way? No – he followed Jesus on His journey. My guess is all the way to the cross. And now you know, (perhaps) the rest of the story….